go up when the count down timer hits zero... Click the button below to secure your discount today! save over 75% when your order from this special early bird page today! Day & An Unstoppable Avalance Of Leads & Sales!" Subject: Getting an insane amount of clicks, leads and sales from your blogs. As you no doubt know, blogging is one of the most effective ways to generate free traffic these days. Google loves WordPress blogs and with very little effort you can easily rank high and get loads of traffic to your blogs. You see... most of your blog visitors have gone completely "ad blind"
They've seen all the banners before - they know they are being sold to and they don't like it. The automated amazon review blog you set up last week ... they've seen 100 identical copies of that and they are not going to buy anything from it! And that Aweber form on your side bar... well good luck with that! And that's exactly what the Covert Action Bar 2.0 is designed to do. That Ever Happened To Pop Up Advertisers! 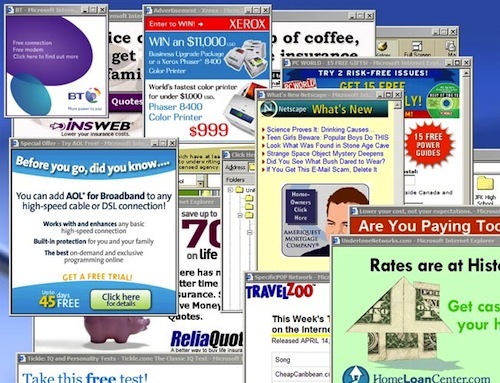 Remember the days when the internet was littered with pop ups and your screen could look like this...? 90% of the pop ups your browsers block are actually stuff you want to see! Now here's the thing... That pop up blocker bar looks almost the same in every browser. Some form of yellow bar with a text message on it and something to click (in order to see what was blocked, allow it to display etc) - and a very distinct sound will play too. And lets be honest - since mostly good stuff is blocked these days, every time you get one of those pop up blocker message you notice and you go to see what was blocked - everybody does! Is Deeply Embedded In The Human Mind! And because of this they are seeing better results from their ads now than before pop up blocking browsers became the standard (even though they of course receive fewer ad displays). When we realized this... the proverbial penny dropped for us! Why don't we mimic that format completely and serve ads like that on our blogs? And that's exactly what we did... and thus Covert Action Bar was born. 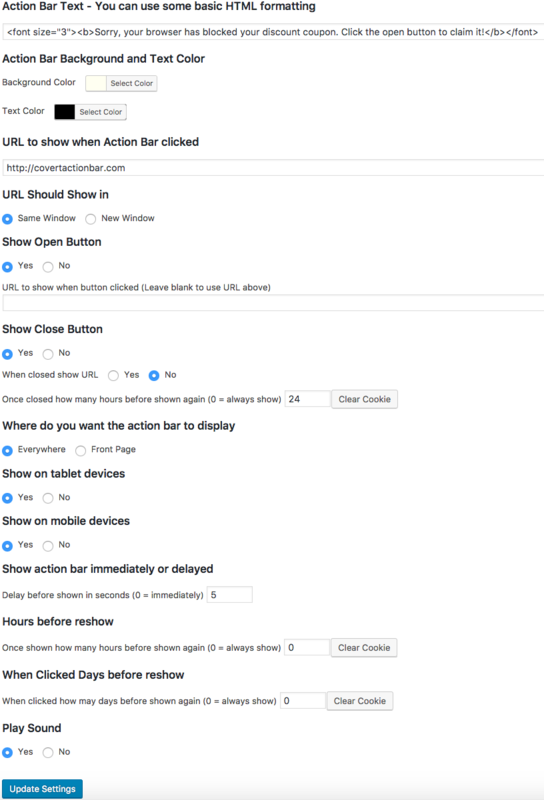 How Covert Action Bar 2.0 Works & How It Uses Deep Rooted Psychology To Almost Force People To Click Your Ads! And in just a couple of minutes you can have a Covert Action Bar live on your blog. It will look like a normal pop up blocker notification from Internet Explorer - It will even play the same familar sound! Your visitors will instinctively be drawn to the bar to see what was "blocked"
Than All Other Ad Forms Combined On Our Blogs! On a review blog - make a Covert Action Bar that offers a discount but tell them it was blocked. Then ask them to click the link to claim their coupon! Offer a freebie related to the content on your blog. Make it seem like the download was blocked and ask them to click in order to grab it (then link your squeeze page). Use the same technique to link to CPA offers related to your blog. They won't click your banners, they have seen them all before. But they will click your Covert Action Bar and you can start counting the $$$! For A Limited Time Only You Can Get Your Hands On The Brand New Covert Action Bar 2.0 Plugin At The Special Low Early Bird Price! Even though this plugin is super simple to use - It's still more powerful that any other ad format you have ever tried on your blog. But right now, and from this special page only... You can get your hands on the Covert Action Bar 2.0 plugin for a fraction of that! If your order the Covert Action Bar plugin from this special page today, we'll even include multi-site and site flipping license at no extra cost! Use the Covert Action Bar 2.0 on as many of your own blogs as you like - existing and future ones! Covert Action Bar 2.0 Plugin Before The Price Goes Up! P.S. The only way you can lose here is if you walk away empty-handed... This really is the most effective way to generate more clicks, leads and sales from your blog!